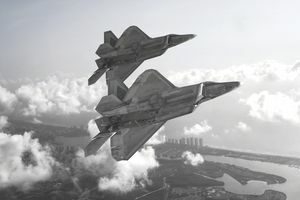 With its speed, agility, precision weapons and stealth capabilities, the F-22 Raptor, a fifth generation, single-seat tactical fighter, was an expensive aircraft to produce, which led to its replacement by the more agile F-35. The U.S. Air Force received its last delivery of F-22s in 2012. The F-22 Raptor fighter jet was jointly designed and built by Lockheed Martin Corp. and Boeing Co. The aircraft first entered service with the U.S. Air Force in 2005 after nearly 20 years of development. U.S Air Force leaders have called the F-22 the best all-around fighter jet in the world, calling the aircraft critical to its tactical air power. The F-22 Raptor fighter jet was developed exclusively for the U.S. Air Force. Export sales of the F-22 Raptor are banned by U.S. federal law, and much of the aircraft’s technology and capabilities are classified information. Military allies of the U.S., such as Canada and Australia are purchasing the F-35 Joint Strike Fighter aircraft, which has some of the same technology and parts as the F-22 Raptor. The F-22 Raptor project was a huge undertaking, with nearly 95,000 workers involved at every level in many states. According to one estimate, the final cost of the project was about $67 billion, with a single aircraft estimated to cost approximately $339 million. The Air Force initially wanted to procure 750 Raptors, but in the end, they purchased only 187 of the aircraft. Then-Secretary of Defense Robert Gates called for production of F-22 aircraft to be stopped. Its speeds exceed Mach 2.0 (more than 1,300 miles per hour), it's agile, has stealth technology, and highly advanced avionics. When combined, these characteristics make the F-22 Raptor an exceptional overall fighter jet. The aircraft has a single seat and twin afterburning Pratt &Whitney F119-PW-100 turbofan engines. For weapons, the F-22 Raptor is outfitted with a 20 millimeter M61A2 Vulcan Gatling gun that can carry 480 rounds of ammunition, two AIM-9 Sidewinder missiles, eight 250 pound GBU-39 small diameter bombs, and two 1,000 pound JDAM bombs. The jet that ultimately replaced the F-22 has not been without its problems as well. Although its weaponry is considered among the most advanced in the world, and the U.S. military has orders through 2037, the expensive F-35 was beset with design problems and production delays. Manufacturer Lockheed Martin was allowed to design and test the aircraft during the production process, instead of fixing potential problems ahead of the production line. The F-35 was first used in combat in 2018 by the Israeli Army. The F-35 is considered a smaller, single-engine version of the F-22. All told, its costs will exceed $1 trillion by the time its production run is completed.